MathJax manager Peter Krautzberger continues his quest to get web browsers to support MathML, by tweeting a link to this page on the Windows UserVoice forum where you can vote to get the Microsoft Edge team to implement the maths markup standard. Vote for MathML support: MathML at Windows Dev Feedback. Now, uninteresting international standards news! It’s easy to forget about MathML, because unless you’re a publisher or doing complicated things with data flows, you never need to see it. I’m not doing a great job of selling this story, am I? I couldn’t even find a picture to illustrate it. After a lengthy lull in which MathML was deeply unpopular, mainly due to browser makers not supporting it but mainly due to it being extremely hard for the average mathematician to work with, the format which aimed to be able to represent all maths is having a bit of a resurgence these days. The web is catching up – MathJax uses MathML to represent mathematical notation internally, and that is adding pressure to browser makers to implement support for rendering MathML without any additional library. The W3C have announced that MathML 3.0 is now an ISO/IEC international standard. That doesn’t have much impact on anything other than giving it a stamp of approval, so you can carry on with your day. See, I told you this wasn’t interesting. For a brief moment at the start of the year, Google’s Chrome browser could render mathematical notation written in MathML. Since then, things have got worse for mathematics on the web. MathML is not something that we want at this time. We believe the needs of MathML can be sufficiently met by libraries like MathJax and doesn’t need to be more directly supported by the platform. In areas where libraries like MathJax are not good enough, we’d love to hear feedback about what APIs we would need to expose so that MathJax, et al, can create an awesome MathML implementation. Peter Krautzberger, manager of the MathJax project, is not happy. Note that MathML has had to be turned off because the code is not yet production ready. We hope to turn it on in some future release. We plan to announce this in the Chrome 25 release notes. To summarize the current status of this bug: We’d like to enable MathML in Chrome, but the WebKit code still needs further improvements before we can ship it. Further information: Enabling support for MathML. Update 07/02/2013: Google giveth, and it taketh away. MathML support in Chrome has been disabled until it’s “production-ready”. Putting maths on the web has always been a tricky proposition. Typesetting notation is a highly complicated procedure, so for years people have got by either by compromising on aesthetics and writing equations in plain, unadorned text, or by using off-line LaTeX compilers to make blurry images of what they’re trying to say. Today, a new Math rendering mode has been added to Wikipedia. You need a Wikipedia account to use it. In My preferences => Appearance => Math, choose “MathJax”. Once enabled, MathJax’s HTML-CSS output will be used by default. 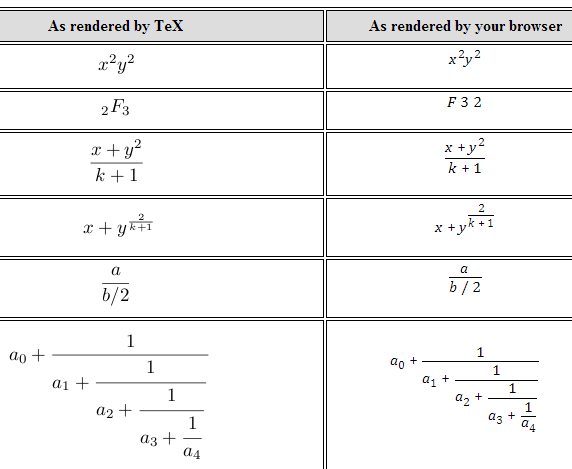 If you want to use MathML instead, right click on a formula and choose “Math Settings => Math Renderer => MathML”. Source: New MathML option available in Wikipedia.